Yano Research Institute (the President, Takashi Mizukoshi) has conducted a survey on the domestic BPO (Business Process Outsourcing) market and has found out the trend by service, the trend of market players, and the future perspectives. The BPO (Business Process Outsourcing) market can be categorized into IT-based and non-IT-based. 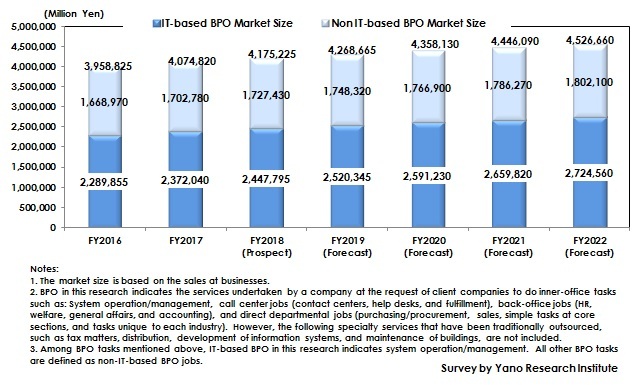 The IT-based BPO market size in FY2018 (based on the sales at the businesses) is likely to attain 2,447,795 million yen, 103.2% of that in the previous fiscal year, while the non-IT-based BPO market size to attain 1,727,430 million yen, 101.4% of that in the preceding fiscal year. The steadfast growth of the IT-based BPO market stems from increase in the volume of data handled by enterprises year by year, bringing about growing number of servers to transfer to datacenters, and from more enterprises reducing the number of employees for back-office IT department in order to outsource the tasks to datacenters. The non-IT-based BPO market has also been stably on the rise, though the pace is relatively slow, as increasing number of enterprises started using external human resources to cope with the serious problem of manpower shortage and shifting to BPO services due to the influence of the law that enables fixed-term employees to request permanent contracts, effective from April 2018. In recent years, many companies have focused on recruitment due to manpower shortage, which increased the number of companies outsourcing recruitment, a part of HR BPO. In addition, by FY2021 there is a possibility of My Number System data to be mandatorily applied to bank accounts, which is expected to increase the opportunity to use BPO for collecting, storing, disposing, and utilizing My Number System data. On the other hand, however, HR BPO tends to be difficult to keep the unit price, because HR tasks are common to all enterprises and are relatively easy for companies to enter the market. Therefore, there are fiercer competitions than other business categories. In addition, many Japanese companies intend to carry out their HR affairs in-house. Some large company groups have their own shared HR-and-general-affairs service company to share it among the group companies. Therefore, in spite of biased expansion of the demand, the HR BPO market as a whole is projected to end up with slight increase. BPO in this research indicates the services undertaken by a company at the request of client companies to do inner-office tasks such as: System operation/management, call center jobs (contact centers, help desks, and fulfillment), back-office jobs (HR, welfare, general affairs, and accounting), and direct departmental jobs (purchasing/procurement, sales, simple tasks at core sections, and tasks unique to each industry). However, the following specialty services that have been traditionally outsourced, such as tax matters, distribution, development of information systems, and maintenance of buildings, are not included. What are IT-Based BPO and Non-IT-Based BPO? ​IT-based BPO in this research indicates system operation/management. All other BPO tasks are defined as non-IT-based BPO jobs.